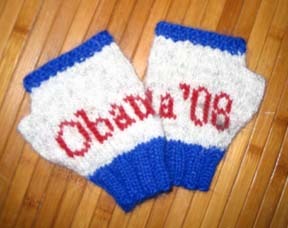 I made these gloves for Governor Chris Gregoire. Remember back in the primary season when it seemed that the candidate would be chosen by insiders, not by the people? What you were hearing from many politicians didn't reflect what you were hearing on the streets. On February 8, the day before the Washington state caucus, Governor Gregoire announced her choice: Barack Obama. She introduced him at the rally at Key Arena and gave an energizing speech. The next day, every county in Washington state went for . . . Obama.